Many, perhaps most, possibly even all Marston’s vocal issues are self-recommending. That’s because of the comprehensiveness of the enterprises, the extremely high level of the transfer engineering - even when the voice is brought forward - and not least the booklet annotations and discographical information. This latest self-recommending disc is devoted to the Supervia, volume two. Naturally there may be theoretical dissent, given that a number of her records have been reissued over the years. But there are some intractable and tough-to-find rarities even in these 1929-30 sides and you’d have to be something of an assiduous collector to have acquired all of them. So a warm welcome is extended to this excellently executed two-disc set, one that’s pretty much filled to the brim. 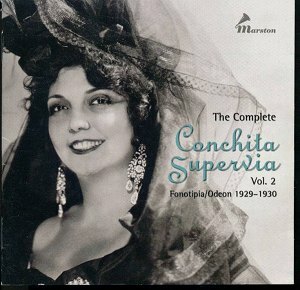 Supervia’s repertoire here embraces her favoured Rossini, Thomas, folk songs, zarzuela, aria antiche, and the famous 1930 De Falla Siete canciones populares españolas with pianist Frank Marshall; there are Spanish favourites and arrangements and more besides. It shows her in the round and often at her very best. Her Rossini, only one example here alas, is brilliantly done. Those unfamiliar with her however will notice immediately the one thing indivisible from her reputation and that is her highly personal and idiosyncratic vibrato. Its rapid oscillation will prove an insuperable problem to the unwary and unsympathetic but collectors know what they’re getting and this is an edition aimed very squarely at them. It’s unfortunate that so vibrant a singer as she was teamed with the straight-backed and dull dog Vincenzo Bettoni in the Thomas extract. One of her best known recorded cycles was Gennai’s Canzoncine with her spoken introductions. Everything about this is delightful – from her lilting and characterful introductions to the diaphanous wit of the orchestrations. Filastrocca dell’asino has always been my favourite with Supervia’s donkey impersonation a treat - albeit her vibrato here and elsewhere is of the intense rattling variety. This particular technical peculiarity need not draw one too far from some imperishable beauties in this collection. Sample the lovely floated tone in the Delibes Eglogue or the passionate conviction of the 1930 Barcelona recording of the Falconieri Occhieti amati. Her aria antiche have a verdant conversational freshness – the Paisiello in particular – though it’s one garnished with a full complement of rubati, portamenti and florid vocalising, Her Grieg is vitiated by the width of her viciously oscillatory vibrato and her Delibes Les filles de Cadix sees some imperfectly taken runs – but what personality! Her de Falla is really magnificent even when most contentious. With the galvanizing Spanish pianist Frank Marshall she turns in a performance of total involvement. The vibrantly communicative element of her musicianship is not one to be compromised by the recording process and one can easily extrapolate the nature of her effect in recital or concert from this March 1930 traversal. There’s electric vitality in Asturiana, explosive tension in Polo, and expressive depth and power throughout. The two pieces from El amor brujo are both exceptionally highly spiced – maybe a touch too much for timid souls. But her Granados Andaluza surely brooks little opposition. Interestingly this was recorded before the voice and piano transcription was published the following year. Production values here, as previously noted, are as high as ever. The Marston marque is one of dedication and quality.